Telltale Games’ biggest, most recent success was The Walking Dead: an excellent adventure game adaptation of the iconic zombie drama property. It walked one of the finest lines in video games, between supporting its story through production and writing while still experimenting with actual game mechanics to enhance the experience. It wasn’t without flaw, either. Refining those mechanics took some effort, and by the time the season-bridging DLC episode released, they’d seemed to have figured out what worked and what didn’t. 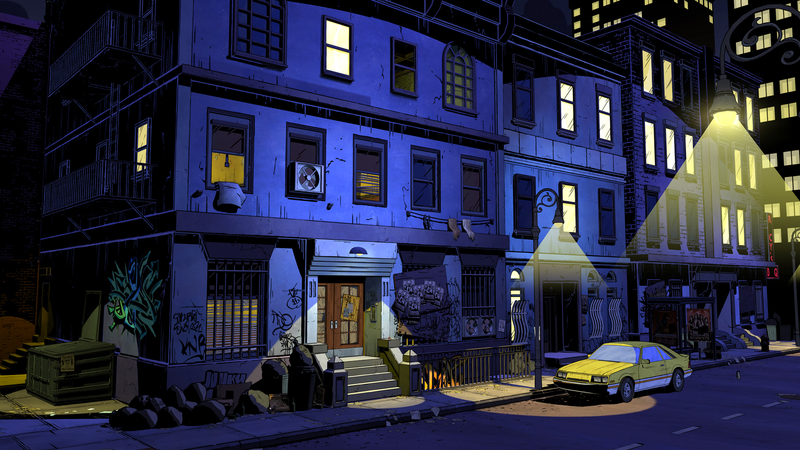 I’m thrilled to report that what I’ve played of their latest, The Wolf Among Us, seems like the most mechanically compelling thing they’ve ever made. The 10-15 minute hands-on demo begins with an absolutely gorgeous title sequence that more directly recalls the visuals of its source material than even The Walking Dead. You’re given about a paragraph of explanation as to what’s going on (which should be familiar territory to fans of the game’s progenitor, the Vertigo comic book series Fables): the world of fairy tales has merged with reality, resulting in tension and disparity between humans and creatures. The fairy tale characters can, however, buy “Glamour,” which allows them to disguise themselves as humans to better blend in. You play as Detective Bigby Wolf (get it? ), who specializes in trying to keep the peace between factions. He’s been called to an apartment building to investigate a disturbance. The immediate distinction between this effort and The Walking Dead is evident seconds after starting. While The Walking Dead supported sub-par graphics and a small budget through a smart art style, The Wolf Among Us takes that framework and runs with it, resulting in easily the prettiest game I’ve seen on the show floor, next-gen or otherwise. The dark blues and purples of detective fiction are so beautifully realized that, and I know this sounds corny, it actually can feel like you’re playing a comic book. Upon entering the building, you’re met by Mr. Toad, re-imagined as a foul-mouthed family man who can’t afford enough Glamour to support his household. Here you’re introduced to the dialogue system, which is nearly unchanged from its state in The Walking Dead. There are three uniquely different options, and, of course, the never-changing fourth, which allows you to stay silent in any situation. I decided to tell off Toad for confronting me with his fairy tale body, and ran upstairs when I heard a commotion. The brief moments when I had direct control over Bigby’s movement were similar to controlling Lee, but everything felt snappier. The UI design is especially sharp, evoking the perfect sense of noir style, and the reticule didn’t feel half as sluggish. In one wonderfully smart moment of character definition, I made the choice to place a hanging pay-phone back on the receiver before tending to the audible shouting from the room at the end of the hall. The scene was predictable: a pretty girl and a boorish thug roughing her up. I was unclear on the specifics, but Bigby definitely seems to have a history with the abuser, who likes to call himself the “Woodman.” He recounts saving Little Red Riding Hood from the Big Bad Wolf — Bigby himself. It was hard to tell if he was crazy, blowing smoke, or telling the truth. But a fight ensued. The speed and animation of the brawl reminded me greatly of the Heavy Rain demo, where you also played a detective roughing up a shady character in a woman’s apartment. The prompts move faster in a way that’s involving, but never really that frustrating. I was able to hit most all of them with an Xbox 360 controller. There are also some neat, on-the-fly decisions: do you want to throw the Woodman into the sink or the cabinet? What do you want to say before you push him out the window? Me, well, I told the mysterious woman if she’d mind waiting a second. She said she’d be happy to. I landed on a yellow car. It was Toad’s. I asked him if he had insurance, and he didn’t seem to. He marveled at how even when I come to help, I just leave things more fucked than they were before (his words, not mine). I look over at the Woodman, forehead hanging on the curb, blood pooling. I thought he was dead. Seconds later, he’s grabbing at my legs, trying to finish me off. He throws me up against an advertisement on a bus stop — it’s for some sort of futuristic movie. The game tells me to mash the A button to break free from his grasp. I can’t do it. The meter isn’t filling up, and it just keeps getting harder to sustain. When it looks like there’s no way out, the Woodman’s eyes go blank and blood spurts from the back of his head. The woman came down the stairs onto the street, and killed him from behind. Little Red Riding Hood cracked the Woodman’s axe into his skull, all to save the Big Bad Wolf. I’ve seen a lot of really engaging stuff at PAX Prime 2013, but nothing excited me as much as this demo. It shows how Telltale has grown as a developer, and solidifies the lessons they’ve learned from previous efforts. I don’t know how much agency I really had; I’d suspect very little, but as with The Walking Dead, the choices serve to change the player’s view, and not necessarily the characters. These are games about perception and context, and those two things can change when you do something as innocuous as place a phone back on the receiver. Telltale Games’ The Wolf Among Us is my Game of Show, and it’s set to release this year on PC, Mac, Xbox 360, and Playstation 3, in an episodic format. I can’t speak to anything but what I’ve seen, but I will say this: I could not be more ready to let this story be tailored by how I play.